As I have explained many times, WordPress is the most popular platform which is being used by millions of websites. It can be used to create any kind of websites just with small tweaks. If you are good in WordPress customization, you can easily modify WordPress according to your need. Otherwise, you can use available free or paid themes and plugins to use WordPress according to your need. If you are thinking to start a job related website, you can start with WordPress. There are various themes available which can help you in building a good job website in few minutes. In this post, I am listing 5 best job board WordPress themes to setup a job website. 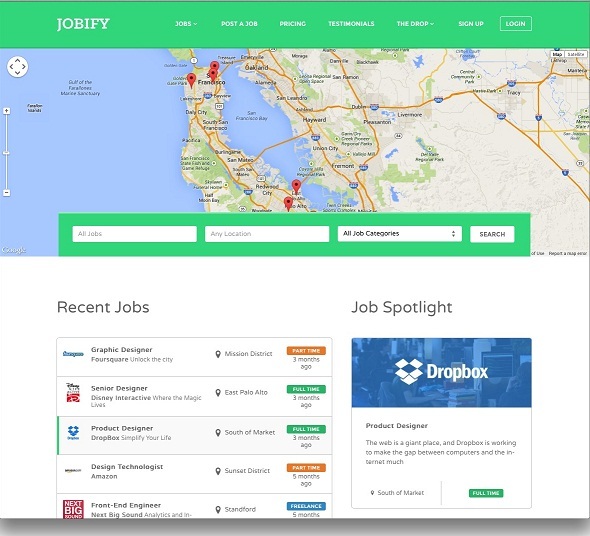 Jobify is one of my favorite WordPress themes for job website. It comes with awesome flat look and responsive layout. It is easy to install. So, you will have a good looking running job website in just 5 minutes. It also has an admin panel to customize the look and feel along with the other options. You can also set price for listing a job on your website and earn extra income along with ads. Jobera is another nice WordPress theme for job portal. It comes with multiple color schemes and unlimited home page variations. Each job listing comes with apply button which lets job seekers send cover letters and resume. Applications are automatically sent to the email of recruiter. Jobera is compatible with WP Job Manager. So, jobseekers can have their online profiles on your website. Recruiters can browse these profiles to find a perfect person for their opening. You can easily monetize by offering premium content, sponsored listing and ads. Nine to Five is a simple and clean WordPress job theme. It comes with responsive design, 50+ powerful customization options, support for most of the international currencies, Paypal payment and many other options. You can also create a separate blog in your job website. It also comes with Google maps integration and SEO related options. JobEngine is a nice premium theme which comes with various options to power your job board. It has various job management options, nice job search page, apply online option, payment options and email templates to send messages to job seekers and advertisers. It also comes with mobile optimized layout and translation support. Best thing of the theme is that it gets regular update. So, you can trust on this theme. WPJobus is another nice job board theme available for WordPress. It basically offers job board, Personal resumes and company profile. It means, companies will have their own profile, people will have their online resume and you will have a job board. You do not need a third party plugin for this theme. All options come with the theme. It also has so many customization options. By default it comes with attractive, responsive and flat design. JobsHub is a clean and responsive WordPress theme to start a job board website. It comes with all tjue options to have your own job board. You can also configure various payment options from admin panel to start offering premium listing services. JobJockey is another cool theme by colorlabs. It is a cost-effective solution for having a job board using WordPress. It also comes with Paypal integration to offer premium content. It is SEO friendly and easy to setup. InJob is also a notable WordPress Job board WordPress theme. It lets you create job listing website without much efforts. It comes with Indeed Integration to earn from indeed affiliate. There is an intelligent search, job suggestions, Payment settings, Woocommerce integration and review application section. There is also an employer and candidate management dashboard. Users can create their profile and online resume. There is also a system to create job alert and review a company. Apply with Linekdin option is also available. For making it easier to customise the look and fee, the theme also comes with powerful Visual Composer and slider revolution. JobCareer is also a good looking Responsive WordPress theme for building a powerful job website. The theme comes with lots of features like job submission, job alerts, email alerts, profile, indeed integration, resume builder, social login and more. The theme is SEO friendly. The theme also looks awesome on mobile devices. Jobseek is also a similar kind of job board theme with powerful features that you would like to see in your job website. It comes with job filters, job submission, job listing, powerful admin panel and more. There is also an option for paid listings, job alerts, bookmarks and resume management. WorkScout is also a beautiful and smart job board WordPress theme. Like other themes in this list, WorkScout also comes with similar job board options. It has job type and tag filters and job management dashboard. There are also few plugins that are being sold separately. These plugins include resume manager, job alerts, bookmarks, paid listings and more. These are few WordPress job listing themes which you can use to start your next job portal. Don’t forget to share your favorite job board WordPress themes with us via comments.